Have you ever noticed hearts in nature? Why would stones, leaves, and other natural things occur in heart shapes? I don’t have a scientific answer, but I feel like mother nature herself is trying to support me by showing me that even in nature, love exists. What do you think? 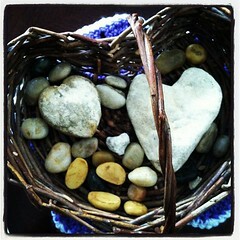 Here at the Christi Center, we collect heart-shaped stones such as the ones in the photo above. We use them in activities or as worry-stones. Many of us have found hearts in nature, as witnessed in the photos below. If you’ve seen any hearts in nature, or taken photos, please share them with us in the comments section below! You can also post them in our Flickr group.